Exactly how widespread is the presence of poisonous arsenic in the groundwater that Indians drink? In Delhi, a doctor's phone call propels Down To Earth to visit Uttar Pradesh's Ballia district. 950 kilometres away from the country's capital, we found village after village affected, effectively re-drawing the country's arsenic contamination map. Exactly how concerned is the government about this insidious pandemic? In Delhi, institutions set up to guarantee safe water to India's citizens, or monitor its quality, brazenly pooh-poohed the problem away. 950 kilometres away, in Ballia town, state officials -- in arrogant tandem -- were equally in denial. Dinanath Singh has a cancerous wound on his left foot from which blood and pus continuously ooze. He has black and white spots (lesions) all over his body. The 61-year-old also suffers from skin cancer. Two fingers of his left hand had developed ulcers and had to be amputated. His ailments are many, but the cause is one: arsenic. Dinanath lives in Ekawana Rajpur village of Ballia district, Uttar Pradesh. He came to the New Delhi-based All India Institute of Medical Sciences (AIIMS) in June 2004 for medical advice. While going through his papers, Neena Khanna, a professor in the dermatology department of AIIMS, and her colleague, Amit Malhotra, came across a startling bit of information. A blood report dated May 12, 2004, showed that Dinanath had 34.40 parts per billion (ppb) of arsenic, when the reference limit is a mere 1-4 ppb, as per leading toxicology manuals. "The presence of such high levels of arsenic in blood can only be possible in case of chronic exposure," felt Khanna. She was particularly perturbed, as Dinanath belonged to Ballia, where arsenic contamination of groundwater was unknown. Worried, she called Down To Earth. She wanted to know what the possible cause could be of her patient's horrendous ailment. She, like us, had heard of arsenic in West Bengal and Bangladesh. "But he is from Ballia," she said. Why him? Where is this arsenic coming from? We were also shocked. Maybe the source of contamination was industrial in nature, we thought. Down To Earth decided to check the story out with the doctor and her patient. At AIIMS, when Down To Earth asked him about the cause of his disease, Dinanath's answer was surprising. He believed the handpump-drawn water he drinks in his village was laced with arsenic. "What evidence do you have to claim this?" we asked. "The doctors at the Banaras Hindu University (BHU) have told me that the water may be contaminated," he replied. We pursued with our questioning: "But is your well contaminated?" "No. Or rather, I do not know." His helplessness was evident. "Please tell me," he told Down To Earth, "if my well has a problem. My family drinks this water. I must know." How had this person, from the invisible backwaters of India, made it all the way to Delhi? Dinanath had been an education instructor with the Indian army for almost three decades (since 1962). After retirement in 1991, he joined a charitable organisation based in Betul, Madhya Pradesh. But when his foot got injured in 1996, the wound would not heal. He went to the Jawaharlal Nehru Cancer Hospital and Research Centre, Bhopal, where the doctors asked for a biopsy. The results showed that he was suffering from squamous cell carcinoma (skin cancer). Why? Nobody knew. If the doctors had investigated his blood, they could have worked out that the lesions were because of arsenic poisoning. But no. From Madhya Pradesh, Dinanath went back to his village in 2002, without knowing that a handpump would seal his fate. His condition deteriorated. Two fingers developed ulcers. In June 2003, Dinanath started visiting the BHU hospital -- the nearest big medical centre to his village. The doctors at the hospital did not know what was ailing Dinanath. So, they amputated his diseased fingers. But they suspected something strange, and referred him to the dermatology department of BHU. One look at the skin lesions was enough for Sanjay Singh, a doctor there, to ask Dinanath to get his blood tested for arsenic. But there is no laboratory in Varanasi that does such a test. The sample was sent to a private pathology laboratory in Delhi. The report, which Dinanath received in April 2004, confirmed arsenic in his blood. Dinanath believed that he would need money for treatment and came to his former employer in Delhi -- the army -- to get his social provident fund certificate, which would secure him free treatment at a government hospital. When in Delhi he decided to seek a second opinion. He visited AIIMS. Here doctors confirmed the diagnosis. Dinanath was suffering from skin cancer. Still, something was strange. Dinanath had been posted in different parts of the country and could have picked up his ailment somewhere else. "What was the proof that his arsenicosis (arsenic toxicity) was because of his well water?" we asked. Dinanath introduced us to his son, 39-year-old Ashok Singh, who was accompanying his father. Ashok had never moved out of the village but also had skin lesions. Nobody had ever checked his blood. We at Down To Earth decided to pay for the blood test. The sample was sent to the laboratory where Dinanath's blood was tested. The result was startling. It confirmed that Ashok's blood contained 34.50 ppb of arsenic. Now we wanted to know more. What about others in the village? After all, it could not only be affecting Dinanath's home. He also had a question for us: "Tell me if my well is poisoned. Tell me what I should tell my family?" Down To Earth decided to visit Ballia. Ekawana Rajpur is about 16 kilometres from Ballia town, along the banks of the Ganga in the Belhari block of the district. It is situated away from the national highway. People here are farmers. The village has no roads, no electricity, no healthcare centre: poverty is evident. The Census 2001 says that this village has 1,800 people. When contacted, household after household had the same dreadful story to relate. All the 100-odd people contacted, many being above 35 years of age, had skin lesions (known as melanosis, the first stage of arsenicosis); in some, the skin of their palms and feet had become rough, dry and thickened (keratosis, the second stage) and a few suffered from breathlessness: doctors say this is the third stage of the disease; in addition to the outward signs, internal complications begin to occur (see box: What the poison does). Visits to nearby villages -- Sughar Chapra, Tiwaritola, Gangapur and Choube Chapra -- showed the disease was well spread. In all these villages, there were people suffering from various stages of arsenicosis. In all these villages, something else was common. People depended on handpumps for drinking water, despite the river being at their doorstep. "Bringing water from the river is time-consuming. The handpumps are located in every corner of the village," explained Dinanath's wife, Basanti, who also has skin lesions. Nobody had told her that a walk to the river could make a difference between life and death. It is precisely these handpumps -- bored to a depth between 27-36 metres below ground level -- that have introduced arsenic into their lives. "The handpumps were put in place in the early 1970s. After these were installed, we started noticing skin diseases. But nobody connected the two," said Ram Bhadhur Singh, a 68-year-old resident of Rajpur diagnosed with skin cancer at the Vineet Skin Institute, Varanasi. "We have stopped counting the number of people who die. Now the river is changing course. It may kill us even before arsenic does, " averred Kanti, his daughter-in-law. Dinanath's own household is tragic proof of the arsenic menace. His two daughters -- Amita, aged 35 and Anju, aged 25 -- died in the past two years. Like Ashok, Arvind -- Dinanath's younger son -- has skin lesions. Similarly, when Down To Earth spoke to R K Singh, the chief medical officer of Ballia district, he was quick to denounce the Jadavpur University's findings. "The report of the university is behind the commotion. But their report cannot be correct, because all its samples tested positive for arsenic, which is clearly not possible." His remarks only prove his ignorance, for the report found a wide variation in the samples checked. He was also not informed about the symptoms of arsenic poisoning. For the administration, the situation was normal. When questioned by Down To Earth on July 28, 2004, district magistrate Vinod Kumar Malik declared: "There is no water contamination in my area." Malik went on to expound his theories: "The katav (river cutting) may destroy the villages, automatically solving the problem of arsenic. Moreover, in all probability this skin problem is due to parthenium -- a weed that plagues the entire district." Down To Earth is in possession of a letter dated July 31, 2004 -- soon after Malik was interviewed. It carries Malik's signature, and is addressed to the director, medicine and health, UP government, asking for a team to be sent to investigate the problem of skin cancer in the district. On August 13, 2004, the UP Jal Nigam, which had also adopted an ostrich-like attitude, wrote to the Jadavpur University, asking for a team to revisit the area to check the water again. Clearly some wheels are beginning to turn. But we had to be sure. We knew that the prevarication and denial game would continue. It is the favourite official pastime. Dinanath and his neighbours would be easily buried in the files of "lack of scientific evidence". Down To Earth had already checked the laboratory procedures needed for collecting samples for analysis. Water samples from Dinanath's handpump, Ramsagar's handpump and Vishnu Gaur's handpump were collected. All these were people who were suffering from what was visibly arsenicosis. The fourth sample was from a handpump, believed to be "clean". We also collected nail and hair samples of people living in Tiwaritola, Choube Chapra and Rajpur villages. All these people had visible signs of the disease. The results confirm what we already knew and the administration refuses to see. Dinanath's handpump has 73 ppb of arsenic -- seven times higher than the permissible limit. Ramsagar Singh, a 75-year old resident of Rajpur, is drinking water that has 47 ppb of arsenic. Because of the poisoning, he has ulcers in his mouth, which have killed the desire to eat. He has a cyst on his side, which may be cancerous. In 1988, he had a tumour-like growth on his thigh. With no access to even the most rudimentary medical facility, Ramsagar himself incised the abscess with a blade and put chuna on the wound. To date, it hasn't healed. His death on August 1, 2004, should be a wake up call for the authorities to act before it is too late. Vishnu Gaur is no longer with us. He died at the age of 42. He was drinking water that has arsenic levels as high as 129 ppb. He had a huge cancerous tumour on his throat. Being extremely poor, he could never visit a doctor. The fourth handpump, at Tiwaritola, has a relatively low 15 ppb of arsenic. Ram Bhadhur Singh of Rajpur has 6,310 ppb of arsenic in his hair. The so-called normal level for hair is believed to be between 80-250 ppb. Can the administration now relate his skin cancer to arsenic? Janaki Devi, a 40-year-old resident of Choube Chapra, has 4,790 ppb of arsenic in her hair. She has skin lesions all over her body. Will the administration still continue to call this parthenium poisoning? Mukheshwar Singh Pande, a 27-year-old resident of Tiwaritola, has 2,480 ppb of arsenic in his nail. The "normal" range is 430-1,080 ppb. He is too young to die. But with this level in his body, doctors will tell you his death by cancer is probable. Unless. Unless something is done to change this. Something is done to explain to people which of their handpumps is poisoned, which is safe. But for this the government must first begin to accept that the arsenic problem goes beyond West Bengal. It must begin to map the extent, mark the handpumps, inform the people so that they can secure alternatives to toxic drinking water. It is a huge task. But it is not impossible. Perhaps Dinanath's lonely journey to AIIMS will change all this. Perhaps. In July 2004, the Union ministry of water resources was asked a question in parliament on the extent of contamination of water by arsenic and fluoride. 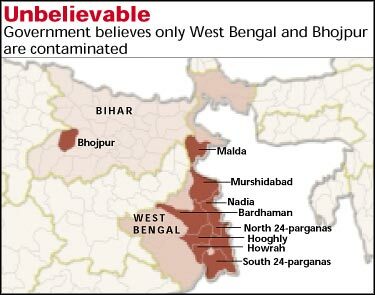 The ministry replied that arsenic had affected the following eight districts of West Bengal -- Malda, South-24-Parganas, North-24 Parganas, Nadia, Hooghly, Murshidabad, Bardhaman and Howrah. Other than this, only Bhojpur district in Bihar was "known" to be affected by excess arsenic. The Union government has a network of 15,000 hydrostations to monitor water quality. Why hasn't this network enabled the government agencies to track down the extent of contamination? But then an easy excuse is that drinking water is a state subject, and hence, says the Union government, its quality is "not its responsibility". Two agencies, along with their state partners, are primarily responsible for groundwater surveillance. The New Delhi-based Central Ground Water Board (CGWB) is charged with monitoring quality and providing technical guidance to state governments. In 2003, it had supposedly surveyed a number of wells for arsenic. But it did not find the toxic element in Uttar Pradesh. It is said of this survey report, which Down To Earth was unable to get its hands on (see box: They seek...), that the agency tested shallow wells, not known to have arsenic. The Rajiv Gandhi National Drinking Water Mission (RGNDWM) is responsible for rural water supply programmes. Till 1998, the Centre had to sanction RGNDWM's sub-missions on water quality, under which 15 per cent of the programme funds are to be used for water quality maintenance. But now these are delegated to the state governments and they are required to conduct a primary water quality survey in 10 per cent of each block; if there are problems of contamination, then the entire block has to be surveyed. But clearly these "surveys" are not yielding much. "As per our 2004 data, 4,973 habitats (a habitat is defined as 100 people or a maximum of 20 households) in West Bengal, 45 in Bihar and 11 in Chhattisgarh are affected by arsenic," Rakesh Behari, director, RGNDWM, told Down To Earth. Monitoring the water quality is a low priority. "Most money is spent on coverage (providing water to as many rural areas as possible). We are helpless to ensure that the state governments pay attention to quality. We can't stop funding them as endless people would die," Behari added. In May 2001, the Union ministry of environment and forests (MoEF) set up the Water Quality Assessment Authority under the Supreme Court's directions. Chaired by the secretary, MoEF, this authority includes representatives from other ministries concerned with water quality. The responsibilities of the authority include drawing action plans for quality improvement in waterbodies and monitoring the implementation of different schemes. But the Report of joint committee on pesticide residues in and safety standards for soft drinks, fruit juice and other beverages has cast doubts on the authority's efficiency to monitor water quality, since it appears to lack the power to take any legal action against other agencies. "To date, our work has been limited to the files. Everybody has forgotten about the existence of this authority. One can gauge this from the fact that its last meeting was held in 2003," admitted V N Wakpanjar, senior joint commissioner with the authority. Clearly it is easier to deny that the problem exists. Less work. Less stress. Who cares about Dinanath? There is no doubt that arsenic is present in Ballia. But why is it there? Is there anything common between the geology of this place and West Bengal, or any other affected area? Why aren't natural arsenic poisoning cases reported from Delhi or Mumbai on a widescale? Why are most affected areas reported to date located near the Ganga? The questions are endless. So are the answers, in the form of scientific theories on which there is no consensus. 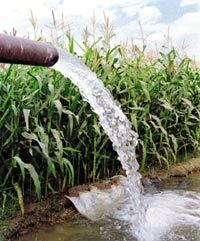 Essentially, there are two main theories and then many sub theories on whether arsenic in groundwater is due to human activities or naturally present and whether it is found in water because of certain soil conditions or is aggravated through human intervention. Unfortunately, the world of science has been so lost in its 'pet thesis' that it has forgotten the human face of this tragedy. The key issue is to understand what scientists believe is the reason for the cause of arsenic and what this explains in terms of its extent. Science must help policy to determine where to begin its search for arsenic. And why? Many scientists believe that extensive use of lead arsenate and copper arsenite as rodenticides and pesticides is responsible for arsenic contamination of groundwater. In a paper, 'Genesis of arsenic in groundwater delta -- an anthropogenic model', published in the Journal of Human Settlements, hydrogeologists P K Sikdar and S Banerjee state that 'arsenicals' dissolve in rainwater and then percolate down into the aquifers. Their theory is supported by other eminent scientists like K C Sahu, a retired professor of Indian Institute of Technology, Mumbai, who was the first to relate arsenic in water to the disease, and Subrata Sinha, former deputy director general of the Geological Survey of India. Sahu also believes that arsenic is emitted from coal combustion in power plants and carried by rivers as it is non-degradable. Moreover, in the river basin, owing to the widespread area, arsenic is traceable in minute quantities -- it gets scattered. But in the deltaic region, due to the narrower area, its concentration is found to be very high. The proponents of the second theory -- arsenic is present naturally in the geology -- are many. They say that arsenic originates in the Himalayan headwaters of the Ganga and Brahmaputra rivers. Over many decades, the rivers have deposited these arsenic sediments across the Gangetic plains and the Padma-Meghna-Brahmaputra basin. The British Geological Survey (BGS), which has worked on the Bangladesh arsenic problem, says that the correlation between iron and arsenic concentrations in the sediments is the key. "The iron oxides scavenge arsenic from soil solution and river water, building up a store of adsorbed (trapped) arsenic," the BGS researchers write in the report Arsenic contamination of groundwater in Bangladesh. Dipankar Chakraborti, director, School of Environmental Studies, Jadavpur University, West Bengal, further explains that the meandering pattern of the river is responsible for the localised depositions of arsenic-rich sediments along the course of the river. This is why arsenic deposits are not uniformly found but are present in pockets along these different states. Subhrangsu Kanta Acharyya and Babar Ali Shah, researchers at the department of geological sciences, Jadavpur University, explain that during the early to mid Holocene period -- 10,000-7,500 years ago -- the rapid rise in sea level and high rate of erosion in the Himalaya led to huge sedimentation in this region. In other words, the deltas of Bengal and Bangladesh were created. It is this massive erosion and sedimentation that brought the arsenic down from the mighty mountains. But still the question is, how does the arsenic trapped inside the sediments leach into the aquifers? That is, why is natural arsenic found in some waters? Even for this there are two explanations: one theory relies on the reduction (loss of oxygen) process and the other on oxidation (addition of oxygen). According to the reduction theory, arsenic is adsorbed by iron oxides, which form a part of fine-grained sediments. These sediments are rapidly 'reducing' (losing oxygen) because the rich organic matter (microbes in the sediments) consumes oxygen. When the sediments reduce (lose oxygen), a series of geochemical reactions occur leading to the release of arsenic into the groundwater. The exact processes involved are not yet well understood. But as per BGS researchers, they are likely to involve one or more of the following processes: (a) reduction of strongly adsorbed arsenic to less strongly bound arsenic, which leads to the release of arsenic from iron oxides; (b) iron oxides partially dissolve and release iron as well as the adsorbed arsenic; (c) the iron oxides undergo changes leading to the desorption (release) of arsenic. Acharyya explains that "arsenic gets preferentially entrapped in the organic-rich clayey floodplain and delta sediments and therefore any delta or floodplain that developed into marshland or swamp is prone to contain arsenic contaminated groundwater." A 2004 paper in the British journal Nature supports this theory, arguing that anaerobic-metal reducing bacteria can play a key role in the mobilisation of arsenic in the sediments. According to this research, arsenic release takes place after iron reduction -- release of iron in anaerobic conditions -- rather than occurring simultaneously with changes in the iron oxides. The other set of researchers believes that the oxidation of iron releases the arsenic in the sediments. These researchers hold that arsenic is present in pyrites -- iron-containing rocks -- that are deposited in the aquifer sediments. When the iron is exposed to oxygen, its capacity to adsorb arsenic reduces, and therefore the toxic chemical starts leaching into the aquifers. This hypothesis is called the pyrite oxidation thesis. Chakraborti proposes that oxygen enters the aquifer because of heavy groundwater withdrawal, favouring the oxidation of arsenic-rich iron sulphide, which in turn mobilises the toxic element into the water. But some researchers say that the oxidation theory fails to explain arsenic contamination in deep aquifers, where oxygen cannot reach. In a paper published in the US journal Science in 2002, they propound organic carbon reduction theory to explain contamination in these aquifers: dissolved carbon in the waters of some regions combines with iron hydroxides rich in arsenic. When these oxides embrace carbon, they simultaneously liberate arsenic, which in turn contaminates the aquifers. These theories should help explain the extent of arsenic in the country. If the first theory -- humanmade -- is accepted, then the region will be as extensive as the use of the contaminants. The second theory of natural arsenic places the possible extent in areas traversed by the Himalayan rivers -- from the Terai region of Nepal to the Bengal-Bangladesh delta. But in this extent, the levels may vary. For instance, Chakraborti writes in a recent paper that "the entire Gangetic plain may not be uniformly affected, despite our expectations that groundwater will be arsenic contaminated over a wide range." The question now is where will this natural arsenic be released or mobilised? If the reduction theory is accepted then the arsenic will be released naturally. Therefore, according to Acharyya, "local arsenic affected pockets may also occur in northern fan areas as recorded from the Terai region of Nepal. Further studies should focus on Holocene alluvium in entrenched floodplains and iron-rich groundwater as the target areas for arsenic pollution." Added to this is the question whether the oxygen entering the aquifers (because of groundwater withdrawal) precipitates this natural process. In a paper published in the US journal Environmental Health Perspectives, Chakraborti and his colleagues explain this saying, "whether the huge groundwater withdrawal pivotal to the Green Revolution allows oxygen to enter into the aquifer, initiating microbial activities, or has any relation to localised increases in arsenic mobilisation, is yet to be understood." It is one thing for scientific theories on arsenic contamination to conflict with each other. But it is another when it plays out in real life. We know that arsenic interweaves with the geology and hydrology of the place where it is found, or not. It is also known that its intensity varies. Its spread may be extensive, but it may be dispersed in a region. Indeed, looking for arsenic in a place the size of the Gangetic-Brahmaputra basin is like looking for needles in a haystack. But look we must. It is equally clear that denial will get us nowhere. Government cannot continue to bury its head in the sand on this issue. This is a human tragedy and it demands a response that is concerted and committed. Firstly, we need a project for widescale monitoring. But it has to be done seriously. It cannot be done like the mystical Central Ground Water Board survey that nobody can lay their hands on. It cannot also be done like the great Ballia experiment, in which samples sent to the laboratory for testing, from the villages where the disease is evident, were found 'clean'. The point is that monitoring must be done for a reason. It has to answer: why are people dying? If it is not arsenic in the water, then what is the cause of their illness? It cannot be buried in the prevarication and apathy of our government agencies. We must map the scale of the problem. We must do this keeping in mind the people who are affected. The monitoring should begin with the people. It should be done by them, with them and, most of all, for them. This is the massive public health challenge. Secondly, we must recognise that arsenic is more about water management strategies, and less about technologies to clean the toxin. The reason there is arsenic in the water, which people drink, is because they have become dependent on groundwater, in a region that is blessed with water on the surface -- in rivers, in lakes, in ponds and in the rain that can be captured and stored for us. The arsenic crisis is a direct fallout of a public health imperative. When policymakers found surface waterbodies caused massive outbreaks of water-borne diseases, instead of tackling contamination they pushed people towards groundwater. Surface waterbodies fell into greater neglect as handpumps became the preferred option to source drinking water. Now, we have come full cycle: handpumps (India mark II and others) are the problem and the solution lies in going back to surface waterbodies and shallow dugwells. Solutions do exist. In Bangladesh, for instance, mitigation efforts include cleaning traditional ponds that were being used to rear fish. The pond sand filter is a resultant invention: it can be installed on an edge of a pond or the bank of a river and uses simple material such as brick chips, sand and coarse aggregates like gravel to clean the water of mud and pathogens. It can reduce pathogens by two orders of magnitude. Rainwater harvesting is another option. These areas, we repeat, are rain-rich. 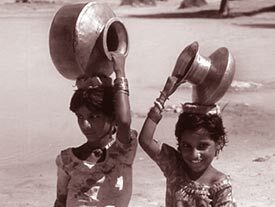 Collecting water from rooftops for drinking, or channelling the rain into shallow bodies or even dugwells for household use is very much on. But this will have to be combined with good sanitation practices, so that human excreta does not pollute waterbodies. Groundwater provides 90 per cent of this country's drinking water today. But there is no one who is capable or able to monitor and supervise its quantity of use, let alone quality of misuse. This is essential. The tragedy of Ballia is the tragedy of an unseen resource -- buried deep in the ground -- which is extracted at will. Arsenic is similar to another problem, fluoride in groundwater (see box: Another scourge). These water toxins are crippling India. We cannot allow our water to become our poison. But this poison is not as deadly as the callousness of the government, which neglects the diseased. When the government denies the existence of the problem, the poison will spread. That is what we really need to worry about.